This soft and fuzzy guy will surely bring smiles to kids faces. 1. 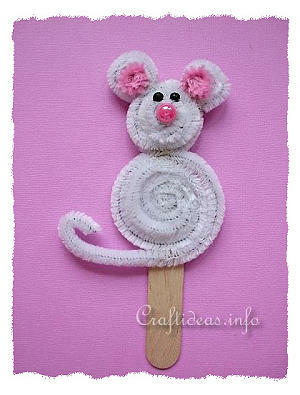 Roll the first chenille piece into a snail shape and end it off with a long mouse tail as seen in the picture. 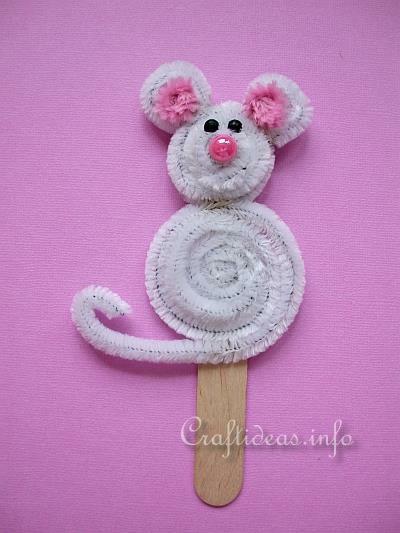 Glue this rolled chenille to the center of the popsicle stick. This will be the mouse body. 2. Cut a 15 cm or 6 inch piece of chenille. Create snail shape and glue it to the top of the stick over the body. 3. Cut a 2 cm piece of white chenille for the snout. Roll it also into a snail shape and glue it to the face. 6. 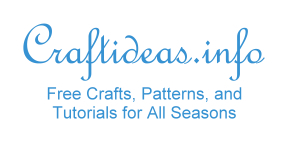 Cut 2 x 5 cm white chenille stems and roll each into a snail shape. These will be the ears. Cut 2 smaller pieces of pink chenille and roll each into a snail shape and glue each to an ear. 7. Parents need to help with this step: place one black bead on the table with the hole facing up. Use the craft knife and press down on the hole causing the bead to divide in half. Glue both halves on the face as eyes. 7. Glue the pink half bead on the snout as a nose.